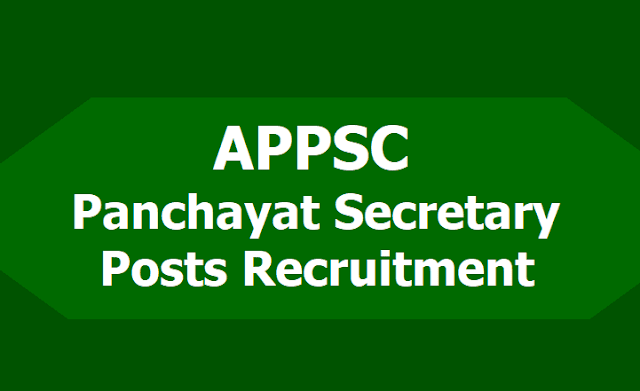 APPSC has decided to fill up the Panchayat Secretary posts. 1051 posts were notified by the A.P state Government. APPSC has given the notification for the recruitment of Panchayat Raj Secretaries in Panchayat Raj Department in the State of Andhra Pradesh. Applications are invited online for recruitment to the post of Panchayat Secretary (Grade-IV) in A.P. Panchayat Raj Subordinate Service for a total of 51 CF and 1000 Fresh vacancies in the scale of pay of Rs.16,400 - 49,870 from candidates within the age group of 18 to 42 years as on 01.07.2018. Andhra Pradesh Public Service Commission (APPSC) has advertised recruitment on 1000 Panchayat Secretary (Grade IV) vacancies. The Commission will also recruit on 51 Carried Forward vacancies through this recruitment cycle. The application process is scheduled on begin on December 27, 2018 and will conclude on January 29, 2019. Candidates will get time till January 28, 2019 midnight to pay application fee. 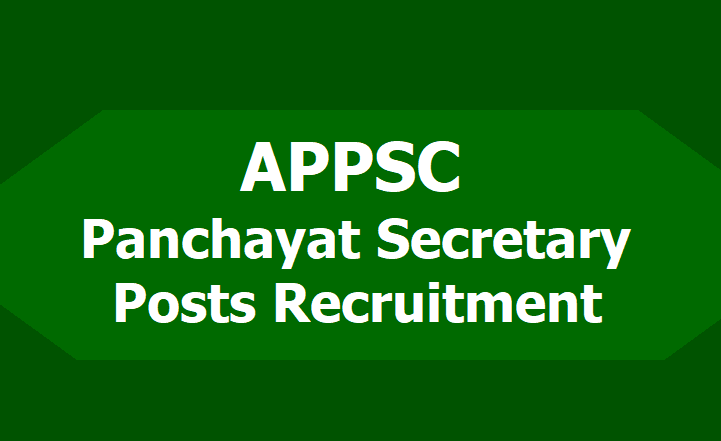 In order to be eligible for recruitment as Panchayat Secretary with APPSC a candidate must be a graduate from a recognized University in India. Age-wise an applicant must not be younger than 18 years and older than 42 years on July 1, 2018. To apply for the recruitment candidates would need to register through One Time Profile Registration (OTPR) portal and obtain OTPR id (if not done already). When the application begins on December 27, candidates would have to login using their OTPR id, pay application fee and complete the application form. Application and Exam Fee: Applicants will have to pay Rs. 250 as application processing fee and Rs. 80 as examination fee. Candidates hailing from Andhra Pradesh and belonging to SC, ST, BC, PH and Ex-Service Men, Families having household supply white card issued by Civil Supplies Department, A.P. Government, and unemployed youth are exempted from paying examination fee. Panchayat Secretary Exam Date: The Commission is likely to conduct a computer-based selection exam which will be conducted on August 2, 2019. If the number of candidates applying for the recruitment exceeds 25,000, the commission may decide to conduct and offline screening test. In case the offline screening test is conducted, it will be held tentatively on April 21, 2019. The applicant is required to visit the Commission’s website regularly to keep himself / herself updated until completion of the recruitment process. The Commission’s website information is final for all correspondence. No individual correspondence by any means will be entertained under any circumstances. Hall tickets can be downloaded whenever the Commission uploads them to its website. Intimation would be given through the website regarding downloading of Hall Tickets. Who are the Panchayat Secretaries? From the past 60 years the Rural Panchayat office works in the circumferences of the Panchayat Raj. The Panchayat office is divided into 4 types based on the income of the rural Panchayaties. At that time the government appointed a Panchayat Secretary for each rural Panchayat in the state. In that period Panchayat Secretaries are called Village Administrative officers. Candidates within the age group of 18 to 42 years as on 01.07.2018 are eligible to apply for this posts. No person shall be eligible for direct recruitment if he/she is less than 18 years of age and if he / she is more than 42 years of age as on 01/07/2018 as per G.O.Ms.No.132,GA (Ser-A) Dept., dated:15.10.2018. Candidates should not be born earlier than 2nd July 1976 and not later than 1st July 2000. 7.2. Age Relaxation is applicable to the categories as per the govt norms. The selection of the Panchayat Secretary is based on written exam of the candidate the candidate must have a Bachelor degree to apply for this post. The lady candidates have 33 1/2 % Reservation for this post. The Commission conducts Screening test in offline mode in case applicants exceed 25,000 in number as per G.O.Ms.No.150, Finance (HR-I, Plg & Policy) Dept., dated: 08.08.2016 and likely to be held on 21/04/2019. Instructions regarding offline examination recruitment test are attached in notification. The Main Examination is likely to be held online through computer based test on 02/08/2019. There would be objective type questions which are to be answered on computer system. Instructions regarding computer based recruitment test are attached in Notification. In case any paper of the Examination is held in different languages, the candidate has to choose the medium in which he/she wants to write the examination and the paper will be valued with reference to that medium only. Generally the APPSC introduced General Studies in Paper-I for all common exams. Like that panchayat secretary post having two papers. The first paper having General Studies and Second paper was done by the candidates in the examination hall. The APPSC covered about the situations and problems of the people who are living in the rural areas in paper-II. Firstly, the Panchayat Raj Act (1994) of A.P state orders the duties of Panchayat Secretary. The duties and responsibilities are changed frequently. Recently the government of A.P order 51 types of duties and responsibilities that are mentioned below. The Online proforma application will be available on Commission’s Website (https://psc.ap.gov.in) from 27/12/2018 to 29/01/2019 (Note: 28/01/2019 is the last date for payment of fee upto 11:59 mid night). Before applying for the post, an applicant shall register his/her bio-data particulars through One Time Profile Registration (OTPR) on the Commission’s Website viz., https://psc.ap.gov.in. Once applicant registers his/her particulars, a user ID is generated and sent to his/her registered mobile number and email ID. Applicants need to apply for the post using the OTPR user ID through Commission’s website.